For the country musician, see Terry McMillan (musician). For the American politician, see Terry McMillan (politician). 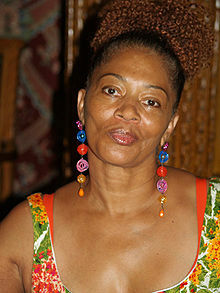 Terry McMillan (born October 18, 1951) is an American author. Her work is characterized by relatable female protagonists. Terry MacMillan at the 2008 Brooklyn Book Festival. McMillan was born in Port Huron, Michigan. She received a B.A. in journalism in 1977 from the University of California, Berkeley. She also attended the Master of Fine Arts program in film at Columbia University. McMillan's first book, Mama, was published in 1987. Unsatisfied with her publisher's limited promotion of Mama, McMillian promoted her own debut novel by writing thousands of booksellers, particularly African-American bookstores, and the book soon sold out of its initial first hardcover printing of 5,000 copies. She achieved national attention in 1992 with her third novel, Waiting to Exhale. The book remained on The New York Times bestseller list for many months and by 1995 it had sold over three million copies. The novel contributed to a shift in Black popular cultural consciousness and the visibility of a female Black middle-class identity in popular culture. McMillan was credited with having introduced the interior world of Black women professionals in their thirties who are successful, alone, available, and unhappy. In 1995, the novel was adapted into a film of the same title, directed by Forest Whitaker and starring Whitney Houston, Angela Bassett, Loretta Devine, and Lela Rochon. In 1998, another of McMillan's novels, How Stella Got Her Groove Back, was adapted into a film starring Angela Bassett and Taye Diggs. McMillan's novel Disappearing Acts was subsequently produced as a direct-to-cable feature, starring Wesley Snipes and Sanaa Lathan and directed by Gina Prince-Bythewood. In 2014, Lifetime brought McMillan's A Day Late and a Dollar Short to television audiences, starring Whoopi Goldberg and an ensemble cast featuring Ving Rhames, Tichina Arnold, Mekhi Phifer, Anika Noni Rose, and Kimberly Elise. McMillan also wrote The Interruption of Everything and Getting to Happy, the sequel to Waiting to Exhale. McMillan married Jonathan Plummer in 1998, who came out as gay during their marriage. In March 2005, she filed for divorce. On July 13, 2012, she sold her 7,000-square home in Danville, California, before moving to Los, Angeles, California. McMillan has one child, a son, Solomon. Mama. Houghton Mifflin Harcourt. 1987. ISBN 978-0-547-52404-7. Disappearing Acts. Penguin Group US. 1989. ISBN 978-1-101-65772-0. Waiting to Exhale. Viking. May 1992. ISBN 978-0-670-83980-3. How Stella Got Her Groove Back. Viking. 1996. ISBN 978-0451209146. A Day Late and a Dollar Short. Penguin Group US. 2001. ISBN 978-1-101-20938-7. It's OK if You're Clueless: and 23 More Tips for the College Bound. Viking Adult. March 2006. ISBN 978-1419397332. The Interruption of Everything. Penguin Group US. May 2006. ISBN 978-1-101-20981-3. Getting to Happy. Penguin Group US. 2010. ISBN 978-1-101-44294-4. I Almost Forgot About You. Crown, New York. 2016. ISBN 978-1101-9025-78. ^ Williams, Andrea (September 17, 2013). "SO WHAT DO YOU DO, TERRY MCMILLAN, NEW YORK TIMES BESTSELLING AUTHOR?". Mediabistro. Retrieved October 15, 2014. ^ Mama, Houghton Mifflin, 1987. ^ Max;, Daniel (August 9, 1992). "McMillan's Millions". The New York Times. ISSN 0362-4331. Retrieved February 22, 2017. ^ Brooks, Daphne A. (2003). "It's Not Right But It's Okay". Souls. 5 (1): 32–45. doi:10.1080/1099940390217331. ^ "ABC News: 'Stella' Inspiration Breaks Silence". ABC News. 2005. Retrieved May 14, 2008. Nishikawa, Kinohi. "Romance Novel." Hans Ostrom and J. David Macey Jr. (eds), The Greenwood Encyclopedia of African American Literature. Westport, CT: Greenwood Press, 2005. pp. 1411–15. Interview with Terry McMillan on the Tavis Smiley Show.